When I asked her what exactly she would do with those keywords, she admitted that she didn’t have a clue. This woman is not alone. So many business owners have an inkling of what SEO is, but they mistakenly think it’s all about using the right keywords. I totally know where they’re coming from. It was exactly where I was about two years ago. Even as an internet marketing specialist, while I’d heard about this thing called SEO, I wasn’t sure what it really meant. And, like the majority of small business owners, I too thought SEO was just about keywords. It wasn’t until one of our customers needed help, that I decided to look into SEO and see what it was all about. One of our clients just loved the new website we’d just built him. However, he complained his sparkling new website wasn’t getting the traffic he expected. He was upset that here he’d spent a lot of money having us build a great website, but nobody was seeing it. I wondered how that could that be our fault? We’d built a great website. It looked beautiful. It even looked nice on a mobile phone. Wasn’t he the one responsible for launching his website to prospective customers? It turns out what he really wanted to know was how to get his website found on Google? It seemed that all of his competitors, who had crappy websites, were at the top of the search results. So, he was confused why his gorgeous website was nowhere to be seen. I felt bad. Here I was an online marketer with knowledge about website design, email marketing, and social media, and yet I had no clue how on earth SEO marketing worked. Ugh! So, I confessed that I thought his website probably needed some SEO. So, I suggested he hire someone to help him with that. He soon came back, saying the “SEO experts” were charging thousands of dollars. And, they said that despite the investment, they couldn’t even promise he’d ever get to the top of Google. I began wondering, what kind of business could charge so much money with no guarantees? That seemed crazy to me. So, I told my client that if he was willing to wait a bit, I’d get out there and see if SEO was something I could figure out. I jumped right in and made a stab at learning this thing called SEO. Much like that lady I met last week, I thought all I needed to do was find some keywords for my client and we’d be good to go. Well, I did find him some keywords, but discovered I had no idea where to put them! This meant I had to dig in a bit deeper. I soon began learning all sorts of things I’d never heard about. Meta descriptions. Title Tags. Alt Text. Keyword Density. Image Optimization. Backlinks. Structured Data. Oh my! My head was spinning. I heard about a great WordPress plugin called Yoast SEO. However, I was in total overwhelm trying to set it up. Once I did get Yoast up and running, I was able to figure out where to put those keywords. But, I quickly discovered that all keywords are not created equal. There are so many things you need to take into account – search volume, competition difficulty, and searcher intent. Oh boy, this SEO thing seemed to be getting more complicated by the minute. Next, I learned that we also needed to set up something called Google Search Console. This would allow Google to crawl and index my client’s website. Oh my. Now I was totally confused. I began to realize that SEO had a whole lot of moving parts. There was so much I didn’t even know… that I didn’t know. It was as if I’d opened up a Pandora’s box and all the evil in the world escaped. When I was first learning about SEO, the scariest part was the all the technical stuff. I remember the first time I came across a tool you can use to check your website’s SEO. Running my own website through it made me feel sick to my stomach. I was amazed at how many websites look great on the front end, but are totally messed up on the backend. I later learned that while WordPress web developers, like myself, know how to build great websites, so many are not designed with SEO in mind. Who knew? Oversized graphics can affect your website’s page speed. Your website structure may not be set up right for search engines or website visitors. If you don’t have an SSL certificate your website will be highlighted insecure and a risky place to visit. Websites need to look just as good on a phone as they do on a computer. Google might not know your website exists. Or even worse, the Google Bots might be blocked from crawling your site. In all fairness to myself and other web developers, there’s a lot to know to create an SEO friendly website. So, if you have a web developer who knows how to do all this stuff (and more), be prepared to pay the big bucks. 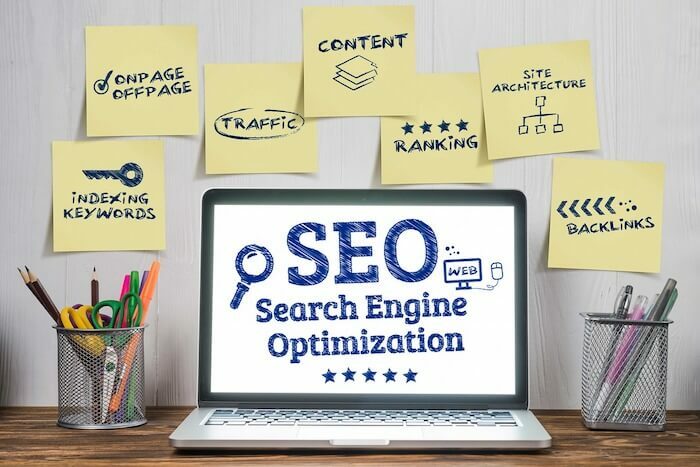 Knowing what I know now, I would recommend you plan your SEO strategy BEFORE you even begin thinking about building your website. Yes, even before you choose the name of your website. Everything from your domain name, type of website (WordPress vs. Wix or Square Space), web hosting, etc. will affect your SEO. Most importantly, if your web developer is not familiar with SEO, then you need to have them work with an SEO expert. Or, better yet find yourself a web developer who already knows SEO. When I first began my SEO journey, I was overwhelmed by all there was to learn. But, step-by-step, I just kept at it. What, at the beginning, seemed like a chaotic mess, slowly began to make sense. After a while, I could see both the forest and the trees. I was able to identify all the elements that are a part of SEO and organize them in a logical manner. I carved out an SEO strategy for my first client and later for our own website. Then I began to see that I could do the same for the rest of my clients. I knew I had this. The funny thing is that I realized that SEO was the core of online marketing. While all the other parts – social media marketing, email marketing, etc., are still very important – SEO is actually the most important. Once I learned about SEO I realized I wanted to empower other business owners. That was when my business partner and I decided to make DIY SEO our specialty service. When you pull back the curtain and tell people all that’s involved with SEO, many people’s eyes glaze over and go into overwhelm. I get it. Been there and done that. However, with the right mentor any small business owner can do this. They just have to know that there’s a lot to learn. That it’s going to take some time. SEO is a marathon, not a sprint. And the best way to learn is in baby steps. I liken it to getting in shape. A crash diet just doesn’t work. Instead, you need to change your lifestyle. You need to eat differently and exercise. There’s no magic pill. It’s going to take work. It’s not going to happen overnight. Instead, it’s about consistent efforts over time. But in the end, you will reap the rewards. Which is why I suggested she set up a SEO Starter Consult with me. That way, we could spend some quality time together reviewing all of her SEO options. And I’ll tell you quite honestly, that some business owners will decide SEO is way too much for them. If you don’t already do your own website updates, write your own blog posts, send out your own email updates, doing your own SEO will probably not be your thing. However, every small business owner should at least learn the basics of SEO. That way, if you do hire an SEO expert, you’ll know exactly what you’re paying for and whether they’re doing the job right. Whatever you do, you simply can’t afford to ignore SEO. Every day that you delay getting involved with SEO you are losing potential customers to your competitors. So, if you too thought SEO was just about keywords, it’s time to learn some of the basics of SEO. Which is why we created a free mini-course: Getting Your Ducks in a Row for SEO. When you enroll in the course you will receive one email per day for 5 days, in which you will learn a little bit about SEO. Think of each lesson as a stepping stone to help you along your SEO journey. It’s a great way to learn in baby steps. By the end of the course you will know for yourself that SEO is more than just keywords. And, more importantly, you will have enough information to decide if SEO is something you’d like to learn how to do… or if you’d rather hire an agency. Hope to see you on the inside. You’ve got nothing to lose and everything to gain.